KME is a manufacturer of high quality, custom fire apparatuses that are used across the country. 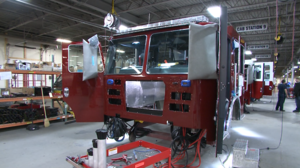 This includes ARFF, Aerial, Industrial, Pumper, Rescue, Tanker, and Wildland Products built on custom or commercial chassis. On this tour, you'll see the steps that go into building one of these impressive vehicles.